These handy little apps have been around for a while, and I mostly though they were destined to fail. Heart rate can only be measured by taking a pulse or using specialist equipment, right? You can pick up Runtastic's Heart Rate app for free on the Google Play Store or fork out £1.99 for the Pro version. The free version is great for a simple check, it allows you to enter how you're feeling at the moment via a range of smileys and add notes and, although it displays ads I would consider them minor. The downside is, at max you are going to be able to monitor your heart rate (displayed in BPM) once before running, once during and once after before you reach the daily cap. If you're planning to use the app more frequently I would definitely suggest forking out for the full version. The app generally it works smoothly although it does sometimes take a while to find my heart rate - but this will vary from phone to phone depending on the strength of the flash and camera. 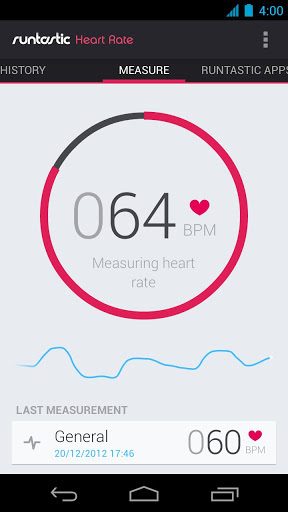 I love the little input graph and have been monitoring my heart rate for a few days now - when I wake up, at particularly stressful situations at work, at the end of the day, it's a great little piece of knowledge to have and will entertain you and your friends. Although it may not be as accurate as going out to purchase proper heart rate monitor kits, it's definitely cheaper, even for the Pro version and definitely more fun.